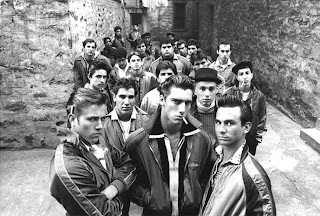 Gang culture of the 60’s, a common theme of the late 70’s early 80’s plays like a nostalgic version of The Warriors, somewhere in between the comic book action of The Warriors and the schmaltz of American Graffiti, Diner or even West Side Story. It's 1962 New Jersey, Frankie Valle blasts throughout the streets. Young gang leader Richie (Ken Wahl) stops making out with his girlfriend to respond to the call from one of his fellow gang brothers. Richie meets up with the runt of the group Joey, who's being chased by the notorious Baldies gangs, identified by their intimidating bald heads. Richie and Joey who are part of the Wanderers engage in a thrilling chase sequence through the streets of Jersey before being saved by a new heavy in town and newest member of the Wanderers gang. And so begins the cinematic adaptation of Richard Price's novel, the true life experiences of Price as a teenager on the mean streets of Jersey. Like the Warriors, everyone is split into racially segregated gangs. As mentioned, there's the Baldies and the Wanderers, but also the black gang the Del Bombers, who wear purple and gold , the Asian Wong gang who specialize in Kung Fu and the Irish Duckies. In between the macho posturing between the gangs, a coming of age story evolves between Richie and Joey. Richie, the womanizing leader of gang finds himself torn between his steady girlfriend Despie (Toni Kalem) and the new hottie in town Nina (Karen Allen), and Joey, struggles to stand up to his overbearing father as well as find a girlfriend himself. What threatens to come off as ugly racial and genre stereotypes actually turns out to be one of the better gang /greaser pictures - at least for two thirds of the picture, but more on that later. Some of the fantastical elements of The Warriors are there including the first confrontation with the Duckies, which is a great embellished and violent action sequence. Missing though is the effect of the violent behaviour. Fights and brawls are mostly humorous and ‘playtime’ for these machos males. Like most films about the 60’s we never really feel like emotional impact of the violence. While its high on nostalgia and period detail, missing is the emotional pathos of say, American Graffiti. Kaufman often shows us a marine recruiter watching the shenanigans from the background. And with the spectre of Vietnam hanging over the film an added big picture historical perspective could have provided some emotional resonance. Unfortunately this pays off with a rather silly sequence when the Baldies get tricked into signing up for the Marines by a particularly slimy and moustache-twirling recruiter. Kaufman’s dramatization of the 60’s milieu is progressive. The depiction of sexual discovery and the genuine fear and ignorance these macho men had of women is on the mark. Kaufman is aware of the stereotypes of the 'greaser' film and mostly avoids the hokiness of say, ‘Grease’. Kaufman even helps create some stereotypes, helping to birth the cinematic depiction of the Jersey mob, 10 years before Goodfellas and 20 years before The Sopranos. Their Hawaiian shirts and bowling alley locales are hilarious and perhaps its the first cinematic incarnation of the phrase 'forgettaboutit'. Kaufman even makes light of the grislier elements of the mafia by crafting a funny sequence out of a group of loan sharks who fall victim to the mafia’s punishment using a bowling ball as a blunt weapon. Kaufman’s sharp direction and affable treatment of the subject matter is let down by a silly third act, which begins with a lengthy and head scratching football sequence that rivals the Vampire baseball sequence in Twilight. The final confrontation with the Duckies doesn’t make sense at all and is more in keeping with Roger Corman camp than intelligent observation. And on a side note, watch for a fun over the top performance from Linda Manz of Days of Heaven fame and look in the final credits for Scott (Boss-zilla) Rudin was the casting director. The film takes place in the Bronx, New York ... not in New Jersey. Real names of actual Bronx gangs of the era are used - the Fordham Baldies, the Del-Bombers, the Ducky Boys.